Click on List Settings >> and then Permissions for this list. From the ribbon, Click on "Stop Inhering Permissions" icon as in the below image. Breaking permission inheritance does not remove all existing permissions immediately! A copy of the parent's permissions is applied to the child object (such as List/item) before permissions are broken. Remove the Users or Groups who does need to have access to this list. Grant permissions to additional users and groups who needs to have access to this list. 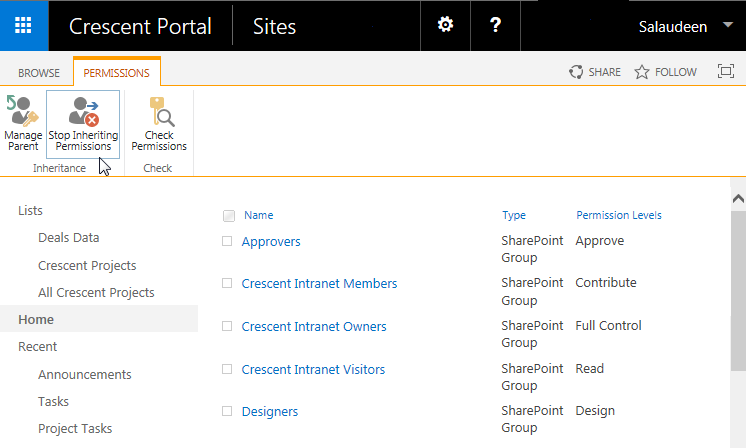 Make sure you have broken the permission inheritance before adding or removing users to SharePoint list. Otherwise, you'll get "This operation is not allowed on an object that inherits permissions" Exception! To break permission inheritance on a SharePoint site or list, use this PowerShell script. To Remove all permissions already inherited to the list, Set the variable $CopyParentPermissions to $False. Once the permissions are broken from its parent, we can add or remove users to the list using PowerShell. Use this PowerShell in SharePoint to add permission to a list. Make sure you already broke the permission inheritance prior running this script.